I have been avoiding reading regency stories but when Maria Grace told me the plot of her latest work, I could not resist reading it! Firstly because I was very impressed by the last to books I read from her, Snowbound at Hartfield and Pemberley: Mr. Darcy’s Dragon, and secondly because what could be more romantic than having an artistic Darcy whose muse is commanded by Elizabeth? The story is quite short and can be read very quickly so I recommend it to readers who need a quick romantic getaway. It will follow the events of Pride and Prejudice making it a familiar story and therefore very easy to read. The only changes are related to Darcy’s muse which will have an impact on how you see Darcy. I personally would have liked a bigger change in the storyline, so my favourite scene in the book was one involving Darcy and Elizabeth at his studio in Pemberley where they were amongst his paintings, which for obvious reasons, we did not see in Pride and Prejudice. That scene was the best moment in the entire book for me, and I believe it will be for most readers too because in that scene Elizabeth gets to see the real Darcy without any need for words. In one single scene, and by describing his many works and how they evolved, Maria Grace was able to show us exactly how Darcy’s love for Elizabeth grew and how their interactions changed him. It was beautifully done! Plus, his dialogue with Elizabeth got me shivering with excitement, and if there was a book where I got mad at Mrs. Reynolds, this was the one because she interrupted my favourite scene! 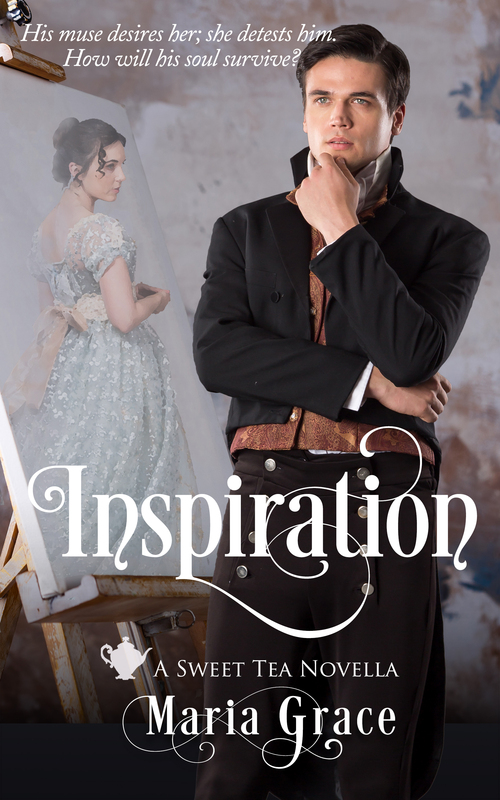 Maria Grace is offering one e-book copy of Inspiration to my readers. To enter the giveaway all you need to do is comment on this post and share your thoughts and opinions with us. I shared an excerpt of this book on the 28th of February and at the time I had established as deadline for the giveaway the 9th of March, however, my real life got in the way and I could not post the review of the book sooner, so I’m extending the giveaway until the 14th so readers can still comment on both posts. I hope you can all forgive me for the delay and take advantage of the extension 🙂 There is still time to comment on both posts to have a double entry in the giveaway and winners may be announced on the 15th of March. I was following this while she was posting it, but since all of it didn’t get posted, I am anxious to see how it finishes. And now I want to see how Mrs. Reynolds interrupted your favorite scene! Thanks for your review. I love the premise of this story in particular that Mr. Darcy is an artist. Definitely can see him in this profession and would love to see how this changes the story. I love all your stories! Looking forward to reading this one as well! Another winner for Maria Grace. I enjoyed reading the excerpts when Maria posted it as her work-in-progress but sadly didn’t have time to read all of her posts. It’s great to know the story is now completed and published in its entirety. Thank you for sharing your opinion on Inspiration, Rita. I look forward to reading your favourite scene in Pemberley. Glad you enjoyed this book,Rita! I can perfectly understand how real life can get in the way! We make plans only for them to go asunder! Sounds like a good read. Adding it to my list. Like Ginna, I was following the story on Maria’s blog. Lizzy freeing Darcy from his creative block is a lovely concept, and I look forward to seeing how Maria gets Darcy to change Elizabeth’s mind about him. Congrats, Maria! Just wanted to say thanks for leaving a comment on my review! I loved your review for this book. I wish I said something about the same scene you did as I did love that part for especially the same reasons!! Thanks so much for sharing your thoughts with us. I’m just curious is there a reason you aren’t wanting to read Regency stories right now? Thank you for stopping by and reading my review Meredith 🙂 When I read yours I felt you were expressing exactly what I felt about this book, I just wish I could have done it as well as you did. I have grown a little tired of reading the same scenes and dialogues over and over again, that’s why I am avoiding regency at the moment. Regency were always and continue to be my favourite JAFF stories, but after reading so many I felt I needed a break. I haven’t read much this year and I think it’s because of that. But I think that I may be starting to miss it again, so after I finish the moderns I have in my pipeline I’ll go back to regency again 🙂 I actually wondered if that has ever happened to you before. You read so much more then I do, have you never grown tired of something in particular in the genre?